Watamu, ‘Home of Sweet People’ in Swahili, is indeed the perfect place to visit for a holiday in Kenya. 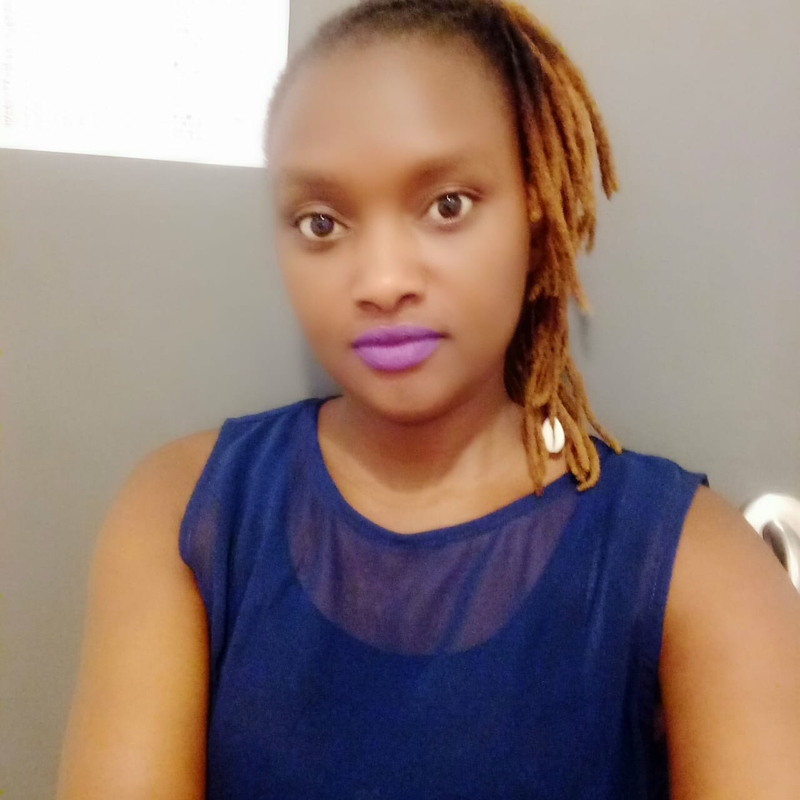 Apart from its very friendly people, Watamu has several attractions to visit, beautiful hotels to stay in and delicious local meals and seafood to enjoy. 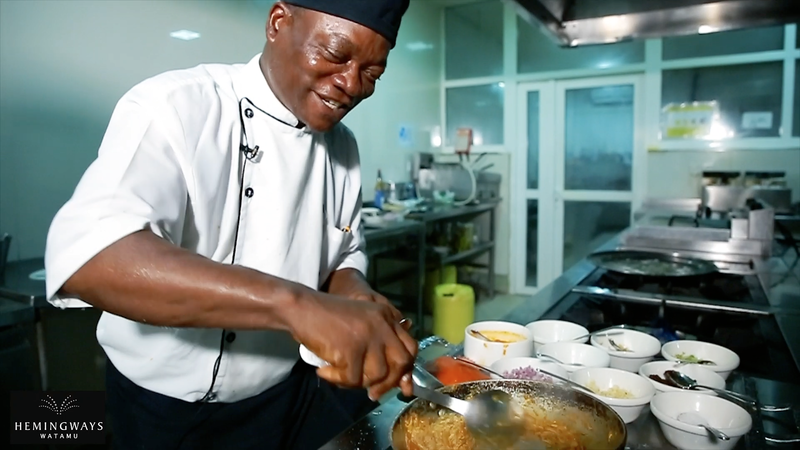 In this edition, the Hemingways Nairobi Executive Chef, Archie Alvin was guest-cheffing at Hemingways Watamu to show you the different cuisines in Watamu, where the ingredients are sought from and also show you how some of your favorite meals are prepared. The first stop was the Food Market. Most of the food ingredients at Hemingways Watamu are picked from this food market which is open daily. There are some vegetables that are also sought from the Chef’s Garden in the hotel. 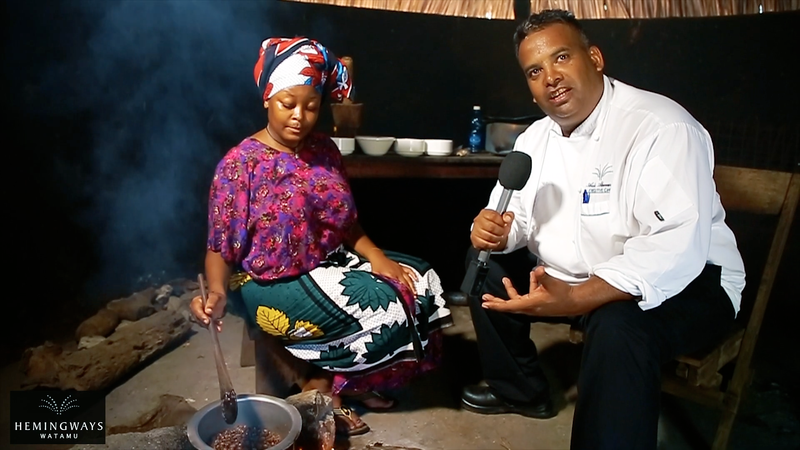 Enjoy a cooking lesson of the famous ‘Mbaazi Mahamri’ from a Watamu housewife. She does it so passionately from scratch. This is where Hemingways Watamu got the inspiration to add this delicious dish to their breakfast buffet every morning. Ingredients: Boiled Pigeon Peas (Mbaazi), Coconut, onions, cooking oil and cardamom seeds. Directions: Using a traditional ‘Mbuzi‘, grate the coconut. Using a ‘Kifumbi’ (a traditional sieve woven from palm leaves) squeeze the grated coconut to get the first milk, put aside the first milk then add water to get the second squeeze. Heat some cooking oil in a pan, add chopped onions, add the boiled pigeon peas (Mbaazi) and stir, and then add in the second squeezed coconut milk. In another saucepan, boil the first coconut milk till it thickens, shell some cardamom seeds and add to the Mbaazi for added flavor. Take out the boiled first milk, which has thickened by now and add it to the Mbaazi and stir slowly to mix it well. Ingredients: Flour, coconut milk, yeast and cooking oil. Directions: Kneed the dough using coconut milk (can use milk or water) and yeast, cut the spread dough into triangular pieces and fry till brown. Watamu is quite popular with its seafood. From prawns, crabs, lobster, Sashimi you name it. Our chef will take you through the preparation of some of these delectable dishes. From the sea, to your plate. 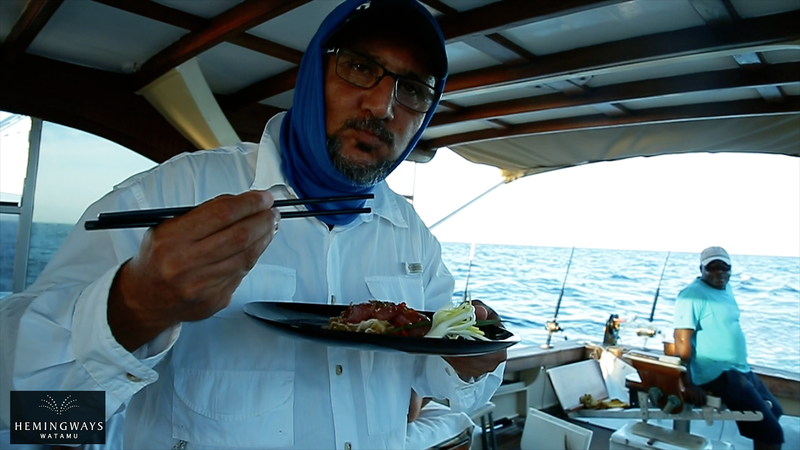 Join the chef as they catch a Rainbow Runner and prepare delicious Sashimi at the sea. Ingredients: Filleted Rainbow Runner, chopped red pepper, chives, onions, ginger, garlic, roasted sesame seeds and soy sauce. Directions: Make a special sauce by mixing chopped red pepper, chives, onions, garlic, ginger, roasted sesame seeds and soy sauce then stir. Slice the rainbow runner into small pieces, and pour the special sauce you have made. Hemingways Watamu Chef Benson shows us how to prepare a tasty ginger crab meal. Ingredients: Cooking oil, chopped ginger, garlic, onions, celery, 200gms of fleshed crab, 5ml vinegar, brown sugar and salt. Directions: Heat a tablespoon of cooking oil in a pan, add one tablespoon of chopped onions, chopped garlic, celery and 2 table spoons of chopped ginger then stir. Add 4 tablespoons ginger sauce and 200gms of fleshed crab and mix well. Put a little brown sugar (to balance the acidity of the tomatoes) and continue stirring. Add a pinch of salt to taste and 5ml vinegar. A day cannot end well without a taste of the Hemingways Dawa. 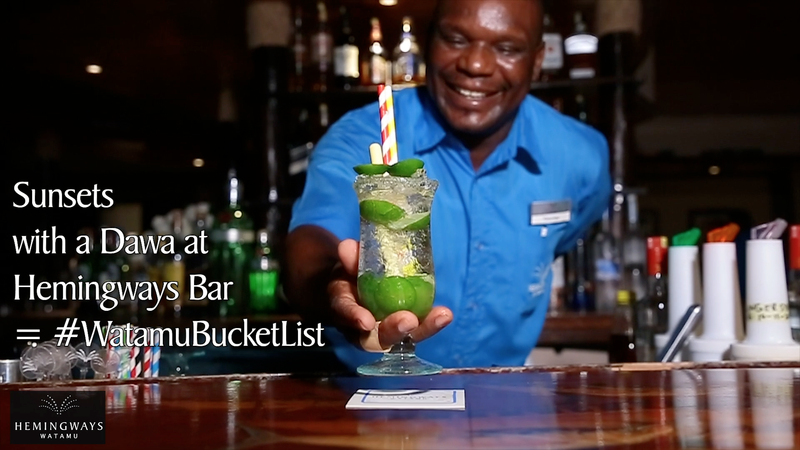 Learn how to make this refreshing drink as Kazungu the mixologist guides you step by step. Directions: Slice up the lime and smear it on the top of the glass. Add some lime pieces in the glass and 30ml honey. Press them together to get that sweet and sour taste. Add some ice cubes to be chilled and then add vodka. Put the Dawa stick (bamboo) and garnish the Dawa with some lime wedges. Two paper straws are added in the Dawa for use when someone wants to taste your Hemingways Dawa. Why Hemingways Dawa is special? The honey used is the Arabuko honey gotten straight from the mangroves! Limes are gotten fresh from the local community. Paper straws (made from recycled paper) are used in aid of saving trees. 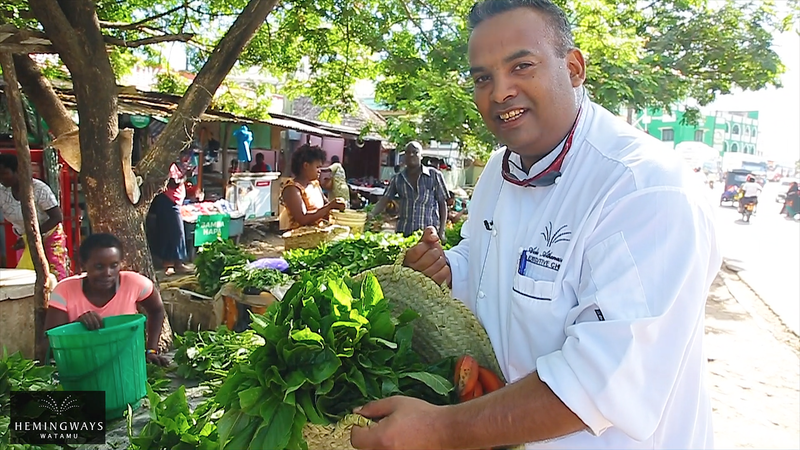 To watch all the dishes and the Hemingways Dawa being prepared visit our YouTube channel and Facebook page.